Winter is here and with it comes colder temperatures. Space heaters can work great as a supplemental source of heat but you may want to consider using them sparingly as they can be costly to operate. 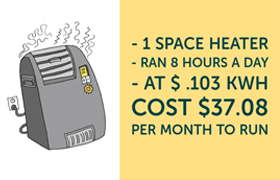 Take a look at JOEMC’s space heater calculator to find out how much it is costing you to operate. Click here to view the Space Heater Calculator. Check out JOEMC’s other Home Energy Calculators for a quick estimate of energy use costs based on your inputs. You’ll be able to input energy-saving scenarios to pinpoint opportunities for savings. Calculators available include those for appliances, lighting, televisions, heat pumps, and more.